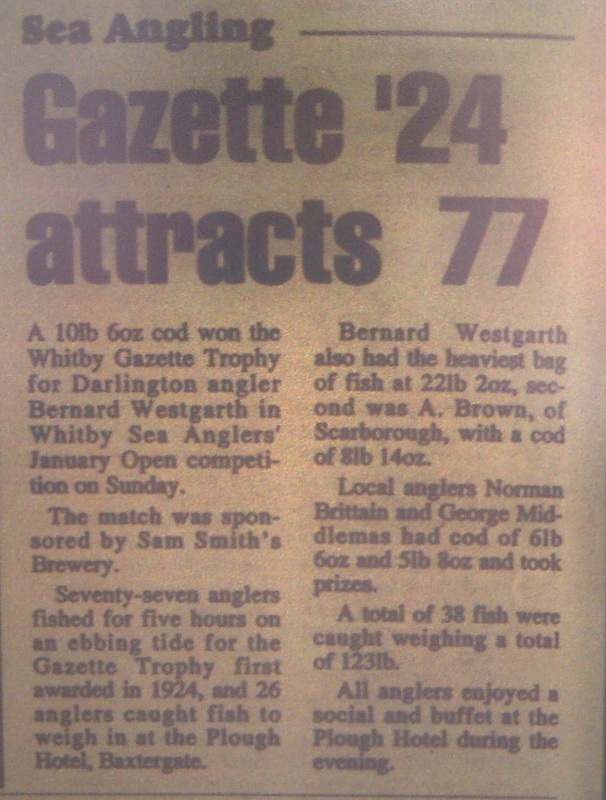 A 10 lb 06 oz cod won the Whitby Gazette Trophy for Darlington angler Bernard Westgarth in Whitby Sea Anglers' January Open competition on Sunday. The match was sponsored by Sam Smith's Brewery. 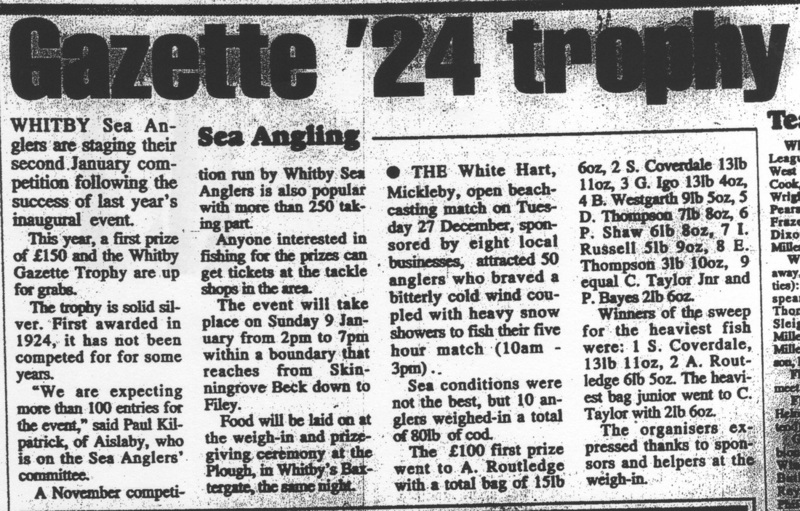 Seventy-seven anglers fished for five hours on an ebbing tide for the Whitby Gazette Trophy first awarded in 1924, and 26 anglers caught a fish to weigh-in at the Plough Hotel, Baxtergate. Local anglers Norman Brittain and George Middlemas had cod of 6 lb 06 oz and 5 lb 08 oz and took prizes. A total of 38 fish were caught weighing a total of 123 lb. All anglers enjoyed a social and buffet at the Plough Hotel during the evening. WSAA - 21 members entered and 10 members weighed in. 6 lb 09 oz - 1 fish. 6 lb 09 oz - 3 fish. 3 lb 10 oz - 1 fish. 3 lb 09 oz - 1 fish. 3 lb 04 oz - 1 fish. 2 lb 14 oz - 1 fish. 1 lb 12 oz - 1 fish. 1 lb 05 oz - 1 fish. Whitby Sea Anglers are staging their January competition following the success of last year's inaugural event. This year, a first prize of £150 and the Whitby Gazette Trophy are up for grabs. The trophy is solid silver. First awarded in 1924, it has not been competed for for some years. "We are expecting 100 entries for the event," said Paul Kilpatrick, of Aislaby, who is on the Sea Anglers' committee. A November competition run by Whitby Sea Anglers is also popular with more than 250 taking part. Anyone interested in fishing for the prizes can get tickets at the tackle shops in the area. The event will take place on sunday 9th January from 2pm to 7pm within a boundary that reaches from Skinningrove Beck down to Filey. Food will be laid on at the weigh-in and prize giving ceremony at the Plough, in Whitby's Baxtergate, the same night.